In the wild, rabbits would spend their time digging, running, jumping, rearing up, hiding, eating, socialising with other rabbits (and being alone some times too). 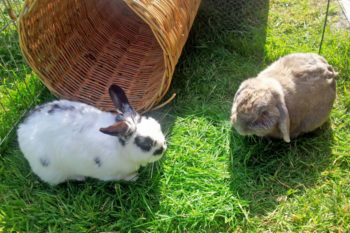 To allow your pet rabbits to carry out their natural behaviours they need to be given plenty to do. We call this enrichment. 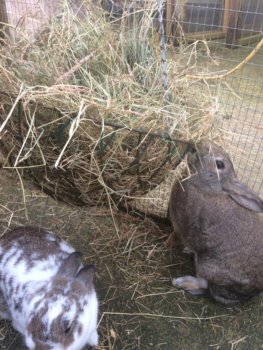 As wild rabbits would spend 80% of their waking time foraging in the wild, most enrichment for our own pet rabbits revolve around hay and grass! You can’t give rabbits too much hay, they need to graze on it all the time. It’s a great idea to keep it in racks so it is off the ground. This gives the rabbits the opportunity to stretch up to reach it, and also stops the hay being soiled on the ground. Hanging baskets from garden centres make fantastic hay racks and can be suspended from the top of the enclosure. Rabbits love to jump into these hay racks so make sure to always keep them very full so that they can’t get their legs stuck! Willow balls and other toys can be placed around the enclosure for your rabbits to play with. We have had some owners say that their rabbits didn’t play with their ball, they just tossed it aside – but that is how they play! Anything that keeps your rabbits safely stimulated and active is great for their well being. Tunnels are important: they will encourage your rabbits to be much more active, and provide a substitute burrow. These can be bought from pet shops or can be as cheap and easy as a cardboard box with a hole cut at each end. 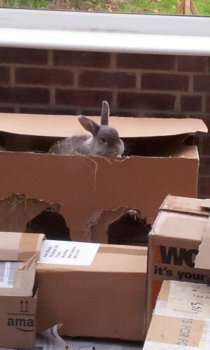 You may find that you never throw away a cardboard box again as your rabbits will play in all shapes and sizes! You will find that they will start their own DIY projects as they ‘knock through’ the cardboard walls but that’s okay, they’re enjoying themselves, just replace the box when they’ve demolished it! Because rabbits are prey animals, rabbits need to know they have both an entrance and an exit so they feel safe to enter a tunnel without being trapped. So just remember they need a hole at each end or they’ll stay away. If your rabbits are not on grass then they will need a digging pit. This could be a large litter tray or planter filled with earth. This will need to be changed regularly. Rabbits love to snuffle around for titbits so rather than put their food in a bowl, put it around the enclosure, in their tunnels or under some hay, this will encourage their natural urge to go foraging. Use a treat ball to feed them, they will nose it around to get the pellets. Willow tunnels stuffed with hay and fresh herbs mixed in their hay are always popular. Willow, hazel, apple and blackthorn branches are always a hit, and are a healthy treat as well as a great addition to the diet. Stuff paper bags with hay and herbs and your buns will wrestle their way in. Got an old muffin/yorkshire pudding tray? put it in the enclosure and fill each of the holes with hay and hide their pellets or a small healthy treat in each one. Stuff the cardboard tube from inside a toilet roll with hay for your buns to pick out their favourite bits. Pick some fresh forage and put it around the enclosure – it’s great for your rabbits and it’s free! 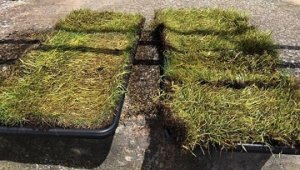 Make a turf tray by filling a litter tray or plant potting tray with turf from a garden centre. This will allow them to eat fresh grass. It’s a good idea to have two so you can swap them in and out to allow the grass to regrow. Rabbits, as prey animals, like to check out their surroundings. You will have provided them with a secure, predator proof enclosure of course, so you know they are safe but it is a natural instinct of theirs to keep a lookout. To allow them to do this, give them something to stand on, perhaps a block of wood or a sturdy box, which can double as a tunnel. 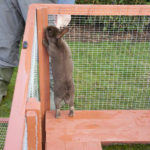 Make sure that the rabbits always have at least 3ft / 1 metre of height so they can stretch up. This will avoid a painful spinal deformity and allows them to check the horizon for predators and feel safe so that they can get on with their busy day of foraging! Switch toys and furniture around every now and again so your buns don’t get bored. You’ll be rewarded with the sight of your buns checking out their changed surroundings and ‘owning’ the corners with their chins, so cute! 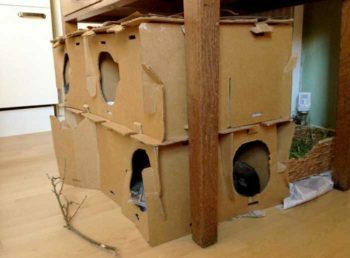 Keep their main bedroom, whether that be a hutch or something else, and tunnels in the same place though – they need to know that their home base is secure and safe. There are countless ways to keep your rabbits occupied – check out our facebook page and share your ideas! Follow RWAF’s board Enrichment for Rabbits on Pinterest.